CCleaner is an easy-to-use, safe, well-known drive cleaner with other additional features including a conservative registry cleaner, startup manager and more. Video tutorial available. CCleaner uses the same, familiar three tab interface it always has with the first tab showing you the main choices including Cleaner, Registry, Tools, and Options. The second tab lets you choose any settings before you run it. The third tab shows you what is happening and what was done. The drive cleaner and registry cleaner are both conservative. There are drive cleaners out there that can clear more space if needed, but they aren't as safe as CCleaner. CCleaner deals with a rather sensitive segment involved in computer maintenance, namely secure cleaning. It performs an in-depth analysis of almost all areas of your system and detects unused or invalid entries that clog the Windows registry, preventing it from running at its best. 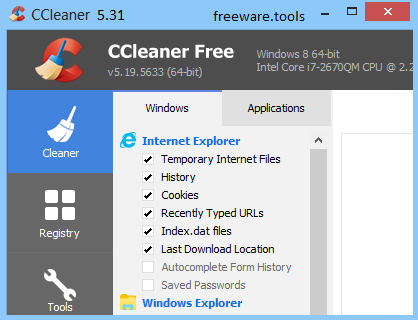 CCleaner Portable is a special edition that can be carried around on a removable drive and run on any computer, without leaving a footprint in the Windows registry. Functionality and appearance are the same in both editions. CCleaner features a clean, professional-looking interface split into four areas: Cleaner, Registry, Tools and Options. Aside from the last one, which deals with application settings, each of the other three perform different jobs in various areas of your machine. The Cleaner section is also divided into two panels: the first one, named Windows, serves for cleaning unnecessary system files (from Internet Explorer, Windows Explorer, Recycle Bin, Cache, Memory, etc), while the second one focuses on removing leftovers from third-party software that was or still is installed on your computer. The Registry module concentrates on repairing issues found in the Windows Registry. After a quick scan, it displays obsolete entries and allows you to fix them, offering to perform backups each time you do it. Usually, it takes more than a scan to identify all of the orphaned items, so you must repeat the operation a few times to make sure that all the issues are detected and eliminated. Extra functionality is offered by the Tools section. It includes an uninstall manager (lists and allows you to remove installed software), a startup utility (deals with the items that load at startup - boot times can be significantly improved from this panel), a system restore feature (allows you to manage all system restore points) and a drive wiper (securely erases the contents of drives). Other tweaks can be performed by accessing the Options panel. Here you can build a list of cookies you wish to keep, as well as set various inclusions / exclusions for the scanning process. To sum up, CCleaner is able to clean your computer of junk files, unused entries from browsers, system files and third-party software. It keeps your computer fit and saves you the time you would spend uncluttering it manually.